This month we welcome Tom and Janice Shefelman to our interview series. I first met this couple while working at Toad Hall, a local independent children's bookstore in Austin, over twenty years ago, and it is so gratifying to see their success over the years and their continued passion to create beautiful books for children. From fascinating travel to classical music, read on to discover what compels and inspires this dynamic duo. JANICE: Since my father was a German professor at Southern Methodist University in Dallas, I grew up in a neighborhood near the campus. He also wrote scholarly articles on German literature as well as his own poetry, a memoir, and a book on our ancestors' immigration to Texas from Germany in 1845. The latter inspired me to write my first book, A Paradise Called Texas, a historical novel that is based on their experiences. TOM: My childhood home in Seattle, Washington, was blessed with a library of beautifully illustrated editions of the classics such as Robin Hood. I knew the stories through the pictures before I began to read them. Also, my mother was a painter, and from an early age I loved to watch her paint in oils. Across the street from our house lived the daughter of Phimister Proctor, sculptor and artist. His bronze sculptures can be seen all over the United States, including his mustangs on the University of Texas campus. He often visited his daughter and would come across the street to give me lessons in drawing and carving. And thanks to Seattle's rainy climate, I had plenty of time indoors to draw, paint, and later cartoon for my school newspaper. JANICE: My father read to me from an early age which began a love affair with children's books. I wrote and illustrated my first story at the age of five, and he saved it. I have always enjoyed expressing myself in words, whether it be letters, stories, or journals. Still, I did not imagine being a writer until I took a college course in children's literature and decided to try writing such a book myself. TOM: I don't remember wanting to be an artist, I just was. I loved drawing and cartooning. It became my ticket to social acceptance and, finally, good grades. Only mediocre in elementary school, I began to excel when Miss Pearl, my fourth grade teacher, let me illustrate my report on Marco Polo's journey. I made it into a picture book and got an "A!" On my ninth birthday my parents gave me a set of Compton's Pictured Encyclopedia. I remember opening one of the volumes to a picture of the Temple of Karnak on the Nile River and marveling at the mighty columns that dwarfed the man standing between them. At that moment I knew I wanted to be an architect. My lawyer father was relieved. He was afraid I might become a starving artist. So now, after leaving my architectural practice for full-time painting and illustrating, I am! JANICE: On weekdays they would see me rising at 6:00 a.m., working out for an hour, having breakfast with Tom, then putting in a couple of hours or more on a work-in-progress. After lunch I might do some research, continue with the morning's work, attend to book business such as correspondence, answering interview questions, and promotion, or run the inevitable errands. Grocery shopping, paying bills, and household chores are saved for the weekend. After dinner with Tom we read and listen to classical music. The first step is to make a storyboard. Using a large sheet of paper I draw a series of rectangles, one for each page of the book. Then I fill them with thumbnail sketches that tell the story. Next I enlarge the sketches to book size, incorporating the text. During this process I collect pictures (photographs, drawings, paintings) and use models. I refine my sketches by drawing on a light table. With a sketch taped to the glass top, I lay another sheet of paper over it and make a more detailed drawing on the lines I can see through the paper. Eventually I take out a sheet of watercolor paper, place it on the light table, and trace the lines with a pencil. Then I get out my brush and watercolors and paint. Whew! JANICE: Ideas are everywhere in everyday life – in books, in the newspaper, in travel, in music, and more. Each one of these places has yielded an idea for a story. In Fehrenbach's The Comanches I read that warriors never rode mares, believing that they were for women and children. 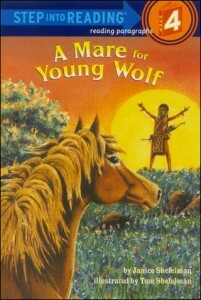 I asked myself, what if there were once a Comanche boy whose favorite horse was a mare? That question turned into A Mare for Young Wolf. I read a newspaper story about a baby orca who got lost from her pod and started following alongside a ferry boat. 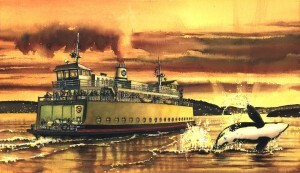 That story became Whale Ferry Tale, a picture book now in the submission process. Tom and I have traveled all around the world, including to the ruins of Knossos in Crete. I love making ruins come to life as I did in Ariadne's Choice, a novel that is also in submission. As for music, Tom and I love baroque, especially Vivaldi's music. We began to wonder what sort of man wrote such passionate music. 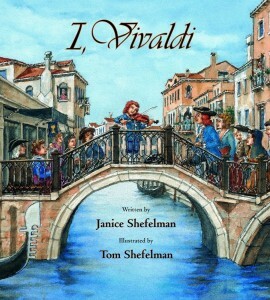 That curiosity became I, Vivaldi, a picture book. TOM: I keep my eyes open, study the best picture books. take my sketchbook or journal wherever I go, and read every issue of Watercolor Artist magazine from cover to cover. JANICE: Just having books published is thrilling, like having a baby. When my baby wins an award, I feel like a proud parent. 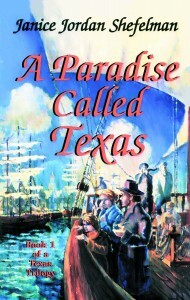 A Paradise Called Texas, my first book, was on the Texas Bluebonnet Award Master List. 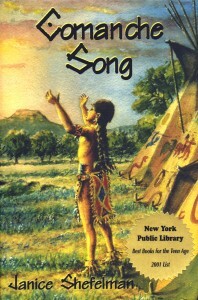 Comanche Song was named a Best Book for the Teen Age by the New York Public Library. 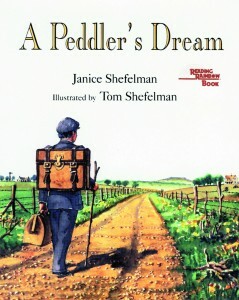 A Peddler's Dream was chosen a Notable Children's Trade Book in the Field of Social Studies, and I, Vivaldi won an IRA Children's Choice Award. But perhaps even better than an official award was a letter and invitation from a fifth grade Shoshone boy in Idaho, a reluctant reader, who told me that A Mare for Young Wolf and the two sequels were the first books he liked reading. He and his teacher convinced the school to invite Tom and me for a visit and program. There we met his parents and tribal leaders who treated us to music and a pledge to set their youth "on the right path." I hope Young Wolf helped. TOM: In addition to Janice's thrills, one of my most rewarding book reviews appeared in Kirkus. Since I had studied Venetian paintings by the 18th-century master, Canaletto, in order to illustrate I, Vivaldi, the following quote was a thrill. "Giving even Canaletto a run for his money, the illustrator sets expressive, natural-looking figures against golden-toned backdrops of 18th-century Venice's rich interiors, splendid vistas, opulent churches and serene canals." Wow! JANICE: Two things. First, that readers take over my books and make them their own. I almost feel the books are not mine anymore. They belong to the readers. Second, the amazing connections books make. I have communicated with strangers in a way I could never communicate otherwise, and I hope made a difference in their young lives. An example: I visited a third grade classroom that had just finished reading A Paradise Called Texas together. Afterward the teacher asked the students to choose something in the novel that had meaning for their own lives and write to me about it. Marshall selected the chapter in which Mina's mother dies. When I read his letter it brought tears to my eyes. He said he wanted to be a poet, and that he had chosen that chapter because his father had died of leukemia a few months ago. He wrote, "Have you ever had a moment of grief?" I wrote back, "Yes, I have. No one escapes this moment. It is what makes us thoughtful human beings and sometimes even poets." TOM: The way children open their arms to us. JANICE: I hope young readers find something that relates to their own lives and helps them understand the joys and sorrows to come and ways of responding. Also, I hope they learn about other times and cultures of the world so that we can have peace. TOM: A visual experience outside their own, which enlarges their world and makes them tolerant of differences. Bio: Janice Shefelman's love of books opened the door to a big world and gave her the desire to see it. After graduating from S.M.U, she taught fourth grade in Dallas and spent one summer bicycling around Europe and another traveling in North Africa and the Middle East. Janice met Tom in Aspen, they married, and set out on a trip around the world for a year, traveling by freighter and living several weeks in a Buddhist temple. 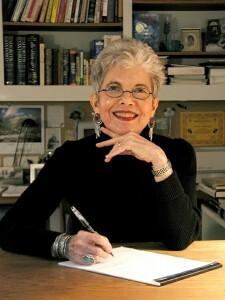 Along the way she wrote articles for newspapers and magazines, which Tom illustrated. 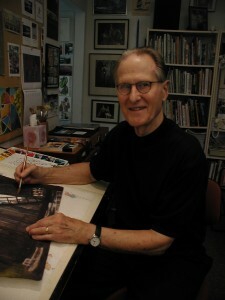 Tom Shefelman knew from childhood that he wanted to be a architect. After graduating from the University of Texas School of Architecture, he went on to Harvard Graduate School of Design at the invitation of Walter Gropius of Bauhaus fame.Returning to Austin Tom worked for an architectural firm before forming his own. Meanwhile he illustrated Janice's books. Janice took up her teaching career, then left to rear two sons, Karl and Daniel, and later became a librarian and finally a full-time writer.